Home › Coconut Colon Detox Supplement Super Formula For Cleanse And Weight Loss - Be..
OUR GUARANTEE: We are so confident that you will love our products that we offer a 100% Money Back Guarantee. If for any reason you are unsatisfied, we will fully refund your money with no questions asked. WHAT IS COCONUT COLON DETOX: Coconut is extremely rich in natural fiber and is commonly referred to as nature's natural laxative due to its significant benefits to digestive health. This revolutionary formula includes coconut along with several other naturally beneficial plant based ingredients such as Aloe Vera and Phsyllium Husk. Together these ingredients support the process of purging toxins, bacteria, and damaging parasites from your body. Our 30-day cleanse is made with fibers and nutrients of the highest quality and is based on scientific research on digestive health. This powerful blend will allow you to detox and cleanse your body naturally from the inside out without any harsh side effects. This Cleanse will not leave you feeling cramped, sick, or dizzy and will not damage good bacteria populations in your gut like some other harsher cleanses on the market. 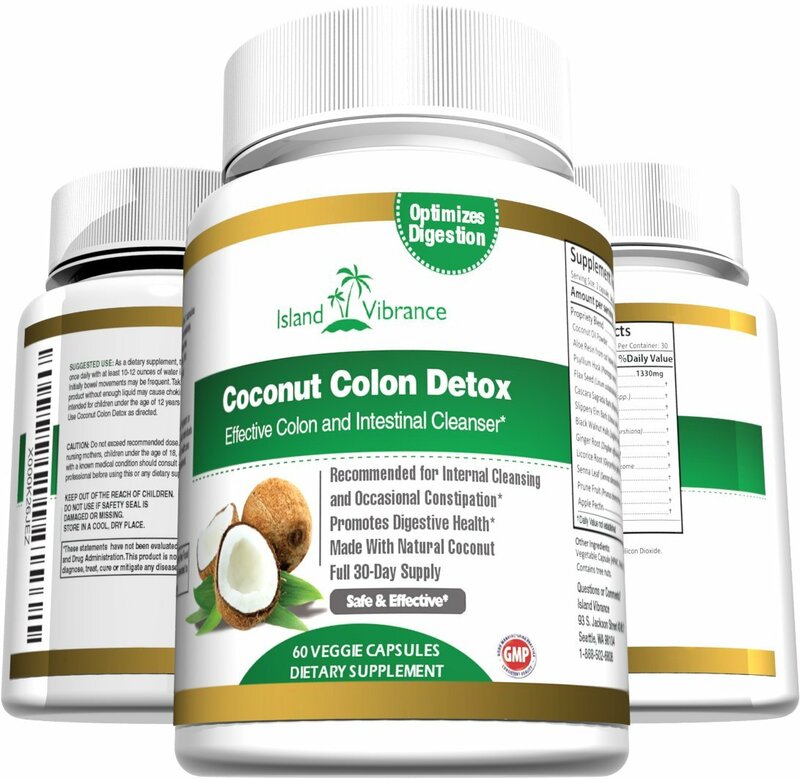 WHAT COCONUT COLON DETOX CAN DO FOR YOU: Island Vibrance Coconut Colon Detox is a safe, natural, and effective way to improve your health. If you are struggling with unexplained weight gain, bloating, gas, slow digestion, or constipation, it may be a result of an unhealthy colon. With just a couple of capsules per day, our formula will cleanse your colon and lower intestines, purge toxic waste from your body, aid in kidney and liver detox, and boost your metabolism by taking stress off the pancreas and thereby assisting in fat burn. You will experience the benefits of restored energy, weight loss, reduced constipation and bloating, healthier skin, and improved vitamin and mineral absorption. Let our Coconut Colon Detox help you feel energized and rejuvenated to live your best life. WHY CHOSE US: Our formula is the best on the market, blending the highest quality herbs and natural ingredients for a gentle and painless detoxification so safe that it can be used daily. No cramps, bloating, diarrhea, or frequent trips to the bathroom. Our products are 100% safe and natural and contain zero artificial ingredients. At Island Vibrance, we take the quality of our products and your health very seriously. Our ingredients are scientifically tested and all of our products are manufactured in our cGMP compliant, FDA-Inspected facility right here in the USA. WHY COCONUT COLON DETOX: Coconut is extremely rich in natural fiber and has significant benefits to digestive health. This revolutionary formula includes coconut along with several other naturally beneficial plant based ingredients such as Aloe Vera and Phsyllium Husk. Together these ingredients support the process of purging toxins, bacteria, and damaging parasites from your body. If you are struggling with unexplained weight gain, bloating, gas, slow digestion, or constipation, it may be a result of an unhealthy colon. With just a couple of capsules per day, our formula will cleanse your colon and lower intestines, purge toxic waste from your body, aid in kidney and liver detox, and boost your metabolism by taking stress off the pancreas and thereby assisting in fat burn. You will experience the benefits of restored energy, weight loss, reduced constipation and bloating, healthier skin, and improved vitamin and mineral absorption. This powerful blend does not leave you feeling cramped, sick, or dizzy, or damage good bacteria populations in your gut. WHY CHOOSE US: Our formula blends the highest quality herbs and natural ingredients for a gentle and painless detoxification so safe that it can be used daily. Our products are 100% safe and natural and contain zero artificial ingredients. All of our products are manufactured in our cGMP compliant, FDA-Inspected facility here in the USA. WE'RE HERE FOR YOU: Our highest priority is the health and happiness of our customers. Please feel free to reach out to us at any time for more information, questions, or concerns.